I'm already a fan of Irina Miech who is an accomplished wire artisan as well as a bead instructor, owner of 2 retail stores and book author. Her previous Beautiful Wire Jewelry for Beaders 2 book was a delight when I had the chance to review it before. So I was curious to see her latest book Irina's Inspirations for Jewelry: From the Exotic to the Everyday which Kalmbach Publishing recently sent to me for review. This book is different from her wire one as the focus is on inspirations which come from nature, history and art. Click here to see a preview of the book. The 24 projects are suitable for all levels although a few at the end of the book might be a little more challenging for beginners but imminently doable. Along the way, you'll learn a range of different techniques and pick up all sorts of design tips. She covers layering designs in different ways. The Sepia Tones vintage brass necklace for example involves just hanging additional components in front of the brass filigree. But in others, she uses wiring to great effect. Her Shades of the Ocean necklace encourages attention to detail as the hues suggest azure waters on sandy beaches. Her Splendor set shows how she was inspired byGustav Klimt's paintings. With the right components, she was. The techniques she uses stretch from basic stringing, some bead weaving to wire work. The simple metal smith methods covered are well worth learning - like punching holes and making domes out of metal discs (dapping). You will need some special tools but take heart, there are no hot techniques involved. My favorite designs in the book though are those which she wired together. 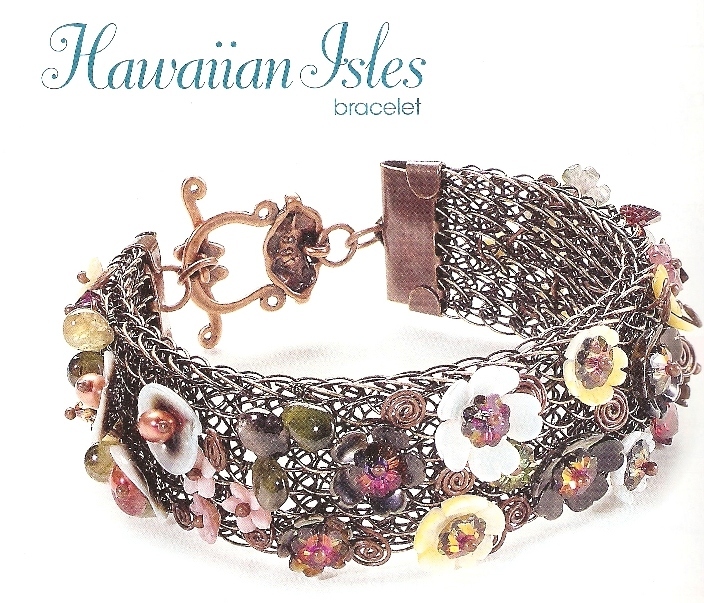 The Hawaiian Isles bracelet started off with a metal mesh. Mesh chain finding fitted the ends. Then the magic came together when she wired the shell and gemstone flower beads with crystal embellishments. 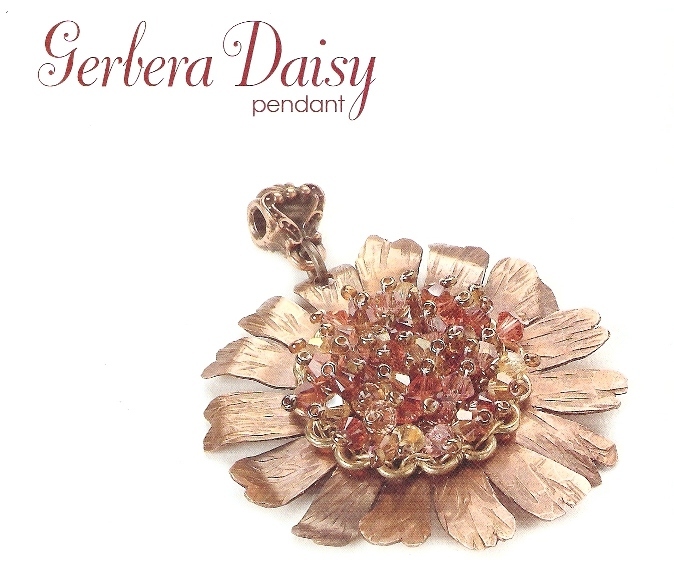 The drop dead gorgeous Gerbera Daisy pendant started off as a round copper disc. Irina used metal shears to cut the petals and hammered it with a texturing hammer. She used a metal punch to make holes so she could wire in a filigree wreath and some metal mesh in the middle. She used the mesh to anchor her beading wire as she worked in plenty of crystal and seed beads. However, her true intent is to inspire readers to use the techniques and ideas and come up with unique designs. And she does that very well. OMG, I'm in love! I thought I would never buy another beading book and I am definitely getting this one! Irina is one of the most creative designers I have seen! You will enjoy the book, I'm sure. All the components are at her retail store Eclecticabeads.com. Not all are on the website. You have to call. If you are going to the bead and button show, I am sure they will have them there too. Thanks for the tip about the components!